Have you ever wanted to design your own town? Would you invest in agriculture, industry or small businesses? Would you start raking in the revenue generated by your citizens, only to turn around and construct some amazing landmarks? If you answered yes to all of those, you have some very odd daydreams. What’s more, I may have just the game for you. 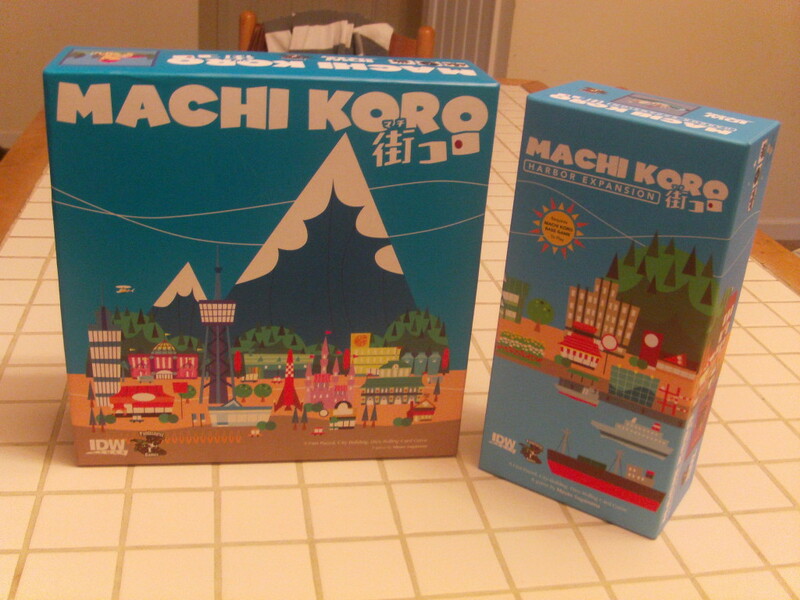 Machi Korro is a city building card game for 2-4 players published by Pandasaurus Games. Originally hailing from Japan, this charming little card game sees players taking turns to roll a die (or dice, later on) and then purchase cards to add to their own little small town. Each card is a new feature to your town, whether it be in the form of a wheat field, forest, café, or stadium (there are fifteen different cards in all). Each card has a number at the top (one through twelve) and when that number is rolled, the text at the bottom of the card takes effect, usually in the form of the card’s owner receiving money. Blue cards take effect no matter who rolls the number, green cards only take effect when you roll that number, red cards only take effect when other people roll that number (but the effect of red cards is that you get to steal some money from the player that just rolled that number) and purple cards take effect when you roll that number (but their effects are rather powerful, so you can only have one copy of each purple card). With the exception of these purple cards, you can have as many copies of a card as you want, multiplying the payout when that number is rolled. What ensues is a lovely little engine for making money. You roll, collect some money, buy a card that will hopefully allow you to collect even more money, which will allow you to buy more cards, which will help you to collect even more money, etc., etc.. But how does this all end, you ask? 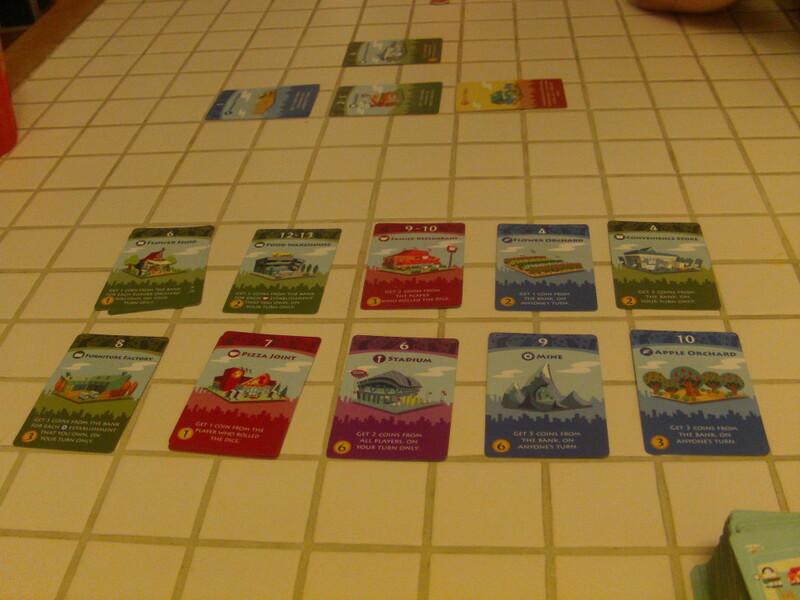 At the beginning of the game, each player has the same four, unbuilt landmarks. Pay the cost of a landmark and you get to flip it over, activating its special ability for your use throughout the rest of the game. Manage to build all four landmarks and you win the game. A clear goal with a pretty straightforward way of getting to it. What’s that? You say that all this is a little too straightforward? 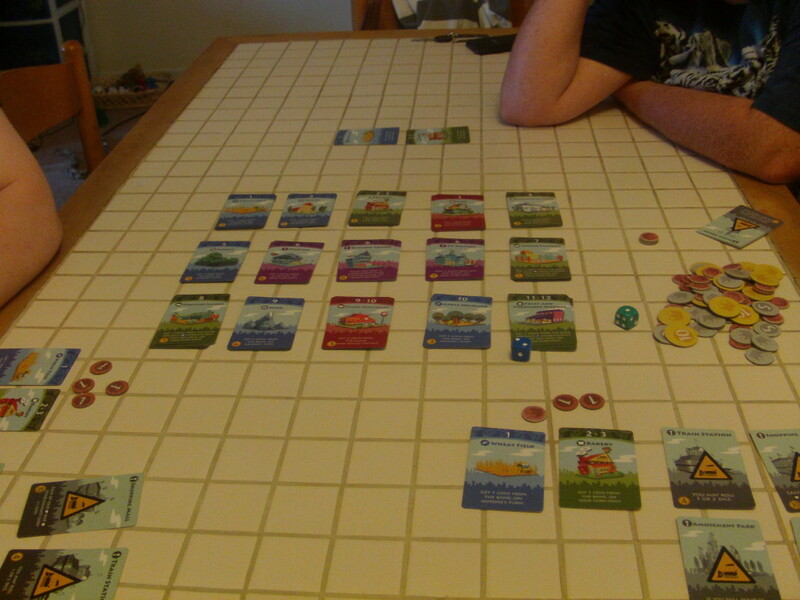 Well, in that case, let’s take a look at the first expansion for Machi Koro, Harbor Expansion. 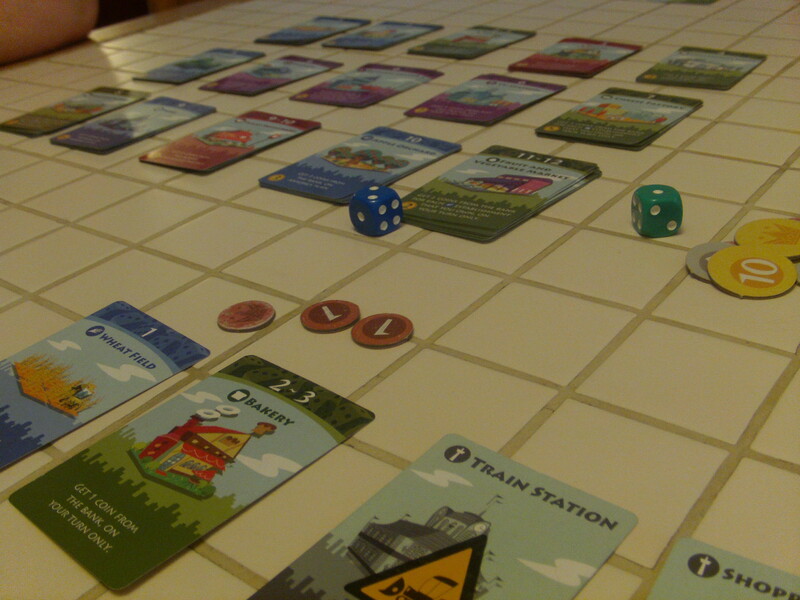 This game adds a fifth player, more money, three new landmarks for each player, and a plethora of new cards. What’s more, this expansion not only plays the way the game unfolds, but it will seriously alter your strategy for winning. You see, in the base game of Machi Korro, all the cards available for purchase are laid out in the middle of the table at the beginning of the game. All of these cards are separated into neat little piles and all are available for purchase at any time (so long as you can afford them and the stock of that type of card hasn’t completely run out.) Well, Harbor Expansion takes that system and completely throws it out the window. Instead, at the start of the game, all these cards are shuffled together and cards are dealt out until there are ten different cards laid out (with duplicates stacking on top of each other). When one of these piles is exhausted, a new card is drawn- if that card is already on the table, they are stacked together and another card is drawn. In this way, there are always ten different cards available for purchase, but there’s no way of knowing exactly what will be available for purchase at any given time throughout the game. So whereas in the base game, you can figure out a strategy and use that same strategy from one game to the next, by changing the basic mechanics of the marketplace, Harbor Expansion fundamentally changes how the game works and your perfectly thought out plans are scattered to the winds. What’s more, by changing the marketplace in this way, it greatly increases the replay value. Play the base game a few times and you’ll easily grow bored- the solution to this game’s puzzle laid bare for you to take the same steps again and again, game after game. But play this game with its expansion and every play-through will be a different experience, forcing you to alter your strategy accordingly. Can you build all the requisite landmarks before your opponents? 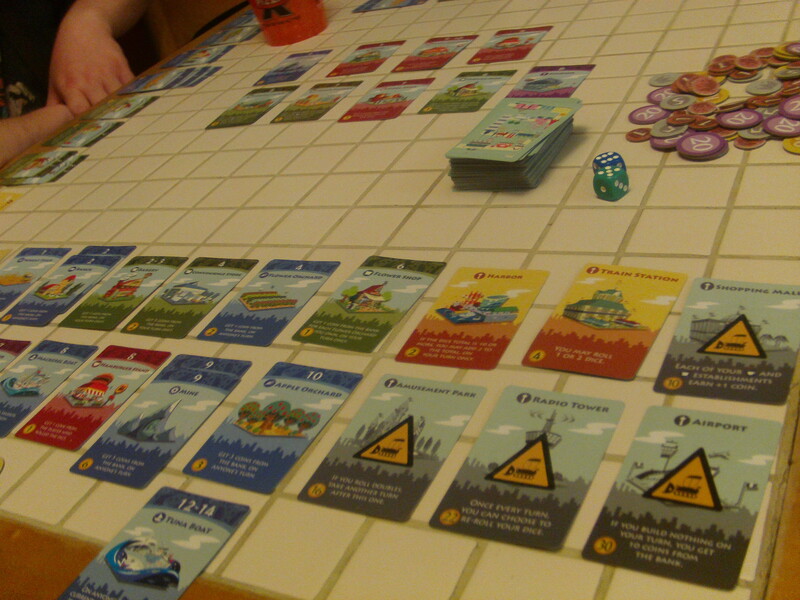 Machi Koro is a fun little game that can give a certain amount of enjoyment, however, Harbor Expansion adds so much more to the experience , it completely changes the game- and for the better. The art on the cards have a charming simplicity to them without seeming bland or underdone. The rules and general concept of the game is simple enough that it is easy to both teach and learn, even when it comes to younger players (suffice it to say, this game is definitely family-friendly). Plus, with the employment of Harbor Expansion, there is a significant amount of replay value- something that one should always consider when investing in a game. 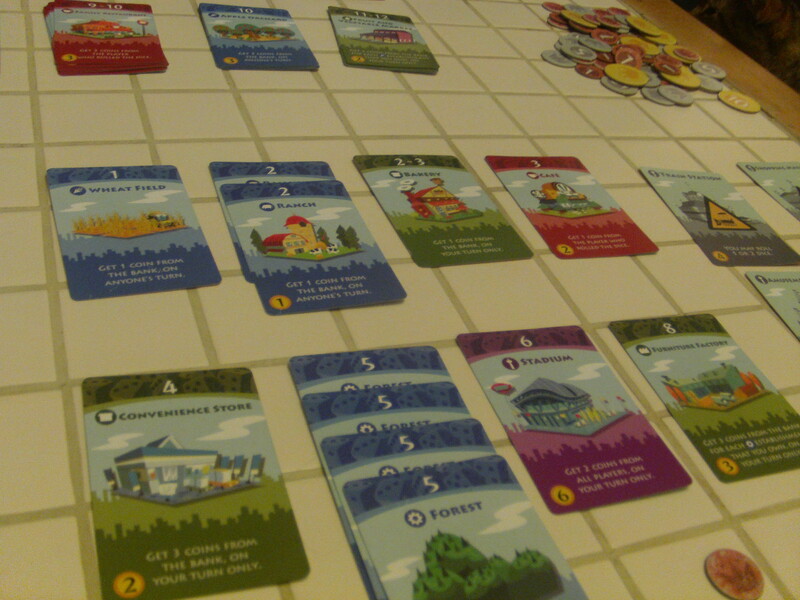 We here at A Space Ahead heartily recommend Machi Koro along with Harbor Expansion. Go out and pick up both of these items and enjoy them- or if you’ve tried the base game in the past and found it lacking, try out this expansion and see if you appreciate the changes it implements to the base game. After all, life can be pretty hectic- why not take a trip to your own little small town?